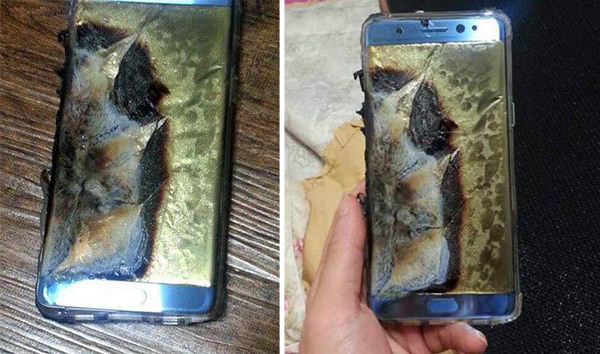 It wouldn’t be the launch of a new, high-end flagship device if we didn’t have a bit of drama, and unfortunately, that’s exactly what one Samsung Galaxy Note 7 owner was on the receiving end of when their brand new smartphone caught fire while charging. The Note 7 was obviously destroyed, and the obvious questions will now be asked in an attempt to ascertain just what happened. Right now, we have few answers to those questions. The one thing we do know is that the device was being charged via a USB-C adapter, and you can even see the charger in one of the photos that were shared by the device’s owner via the social network Baidu. It’s not clear whether that adapter was bundled in with the Galaxy Note 7 by Samsung or whether it is an aftermarket, third-party purchase, but right now, we have little option other than to point the finger squarely at that adapter. Of course, it’s not unheard of for smartphones to catch fire, especially when they are charging. Both Apple and Samsung itself have been caught out by smartphones that have caught fire, or worse, with some actually exploding. Any time you have a battery involved in the proceedings, especially when you’re pumping it full of power, there is always the possibility that something will go awry. 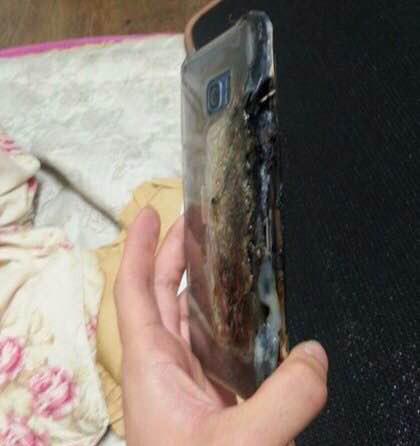 Unfortunately for this Galaxy Note 7 owner, something went very much awry this time around. The Galaxy Note 7 is in the midst of a staged release across a host of territories, with those wanting to pick one up often having to join waiting lists due to a lack of availability even in areas where the smartphone has officially gone on sale. Samsung can take that as a good sign that demand is high, although we obviously have no idea how many devices were available to order on day one. Adapter? Doubt it. Manufacturing defect. Where there’s one there’s more. Now listen to Samsung fans crying … vamos Xperia ! Yet another example of where Samsung is copying Apple. Wow, Columbo. Any evidence at all? Didn’t think so. You are a manufacturing defect. I didn’t see anyone use that term yet till you. Samsung text is missing under the speaker. This must be a china-copy not a real Note7. Opinions? Toy Story 2 was okay.